Sometimes, the exercise is simply not enough to burn all of the accumulated fats. Physical exercise is a good way to spend some calories and strengthen the muscles, but it takes much more to make the body use the energy stored as fat. The proper type of exercise, for those willing to get rid of the body fat, is a cardiovascular training. Cardio training focuses on increasing the heart rate and keeping it accelerated for the duration of training. Another name for this type of exercise is the aerobic training, which is known for many of its health benefits. Exercisers are often confused about measuring the exact heart rate that is sufficient for effective fat loss. Moreover, they are commonly uncertain about how long they have to keep their heart rate elevated. Even though it sounds complicated, calculating this ideal heart rate is pretty much simple. Most of the benefits from cardio training are achieved by exercising in a proper heart rate zone. To calculate this heart pace, one should first understand what the maximum heart rate is. The maximum heart rate is calculated by subtracting the exerciser's age from 206 for women, or 220 for men. The targeted heart rate zone, for successful cardio training, is somewhere between 50% and 75% of one’s maximum heart rate. However, this rule of thumb is applied only on healthy people. Moreover, the heart rate should increase as the exerciser gets in better shape, moving slowly from 50% to 75%. For a successful cardio training, practice a minimum of 30 minutes of moderate cardio exercise five days per week. For more vigorous exercise, 20 minutes of training, 3 times per week should be enough. One can raise the duration of training to increase the aerobic fitness and burn more fats and calories per workout session. A heart rate monitor is a useful fitness accessory to accompany the cardio workout. There are a lot of watches, bracelets and professional heart rate monitors on the market. 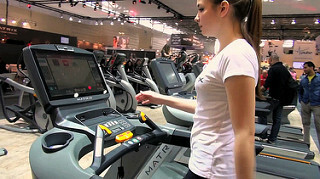 Some of the fitness machines also have heart rate monitors embedded, and display the accurate measurement during the training. To find out how many times the heart is beating per minute, one should place a finger at the back corner of the lower jaw, right above the carotid artery in the neck. The beating of the heart feels as pulsing in the neck.